Are You Supposed to Caulk Around a Toilet or Not? One of the most frustrating debates in plumbing is whether or not you should caulk around the base of a toilet. Both sides of the argument have valid points, and both professional plumbers and building inspectors tend to choose one side or the other based mainly upon personal views. But when it comes to installing a toilet yourself, what is the best answer? There are three major reasons why many professionals are against caulking the base of a toilet. These concerns are backed by experience and have merit, although there are arguments to counter each of these claims. Caulking around the base of a toilet means an extra barrier to break through on top of the bolts and wax seal. On some floors, this may result in damage if removed improperly. It may also stain or leave smear marks if applied improperly, which can be difficult to remove without damaging the floor’s surface. Perhaps the largest argument against caulking is the fact that leaks are less likely to be noticed. There is always the risk of a small leak under your toilet going unnoticed, but larger leaks generally result in visible water seepage out onto the floor. Caulking the base means water will be trapped inside and cause further damage before the issue is discovered. The inclusion of a seal inside the toilet is a third claim often made against caulking. The seal may be made of rubber or wax, and generally, prevents any leakage from the base. While many argue that a wax seal has a more limited function than caulking, the fact remains that some plumbers consider wax rings to be a sufficient answer to plumbing code requirements. There are three goods arguments for caulking around the base of a toilet, as well as one argument that is questionable but included for completion’s sake. The other three arguments all make valid claims, although two of them do include counter-arguments. While not a strong argument, especially with colored models, many experts claim that toilets will look better if there’s no visible seam at the base. This benefit does not pose a very strong argument, but is sometimes used to persuade homeowners. As it isn’t common to focus your attention at the base of a toilet, aesthetic merit is likely not enough to make a case. While opponents are worried about leaks becoming invisible, those who support caulking argue that it has the opposite effect as well. By caulking around the base, water from outside the toilet cannot creep under the toilet. This means that it becomes less likely the floor beneath your toilet will become damaged in the event of an overflowing sink or other cause of bathroom flooding. International Plumbing Code (2012 edition), Chapter 4, Section 405.5 states: Joints formed where fixtures come in contact with walls or floors shall be sealed. Uniform Plumbing Code (2009 edition), Chapter 4, Section 407.2 states: Where a fixture comes in contact with the wall or floor, the joint between the fixture and the wall or floor shall be made water-tight. Opponents of caulking claim that the wax ring already performs this job, while supporters believe that the ring is insufficient for proper compliance. 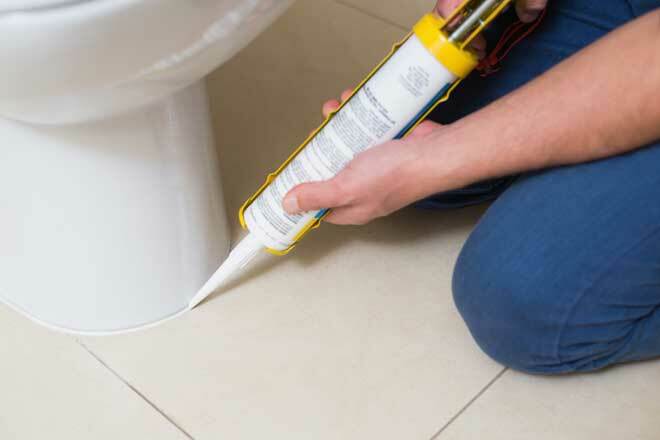 One argument which most experts agree upon is that caulking the base of a toilet to an uneven floor will improve stability and greatly reduce the risk of a leak forming. Placing toilets on an uneven floor prevents a proper seal and the unit will work itself even more loose over time. This may damage or break the wax seal, resulting in leaks. While seemingly the road least traveled, there is a middle ground that takes both arguments and weighs the answer on a case-by-case basis. Many professionals will default to this option unless required to follow one specific route by their employer or local code enforcement. Is the toilet on an uneven surface? If so, the base should always be caulked. Will the bathroom be prone to flooding due to children or other factors? When caulking the base, a small gap will usually be left at the back to allow a homeowner to spot leaks from under the toilet.